What will it be for Bitcoin? $5,500 or $3,000? Although the world's most popular cryptocurrency is still trading in its long-established range between $4,000 and $4,100, some analysts believe the moment of truth for Bitcoin is near. What will it be for Bitcoin? $5,500 or $3,000? Bitcoin has been trading between the $4,000 and $4,100 range for the last 10 days, and today Bitcoin's trading behaviour was no different. 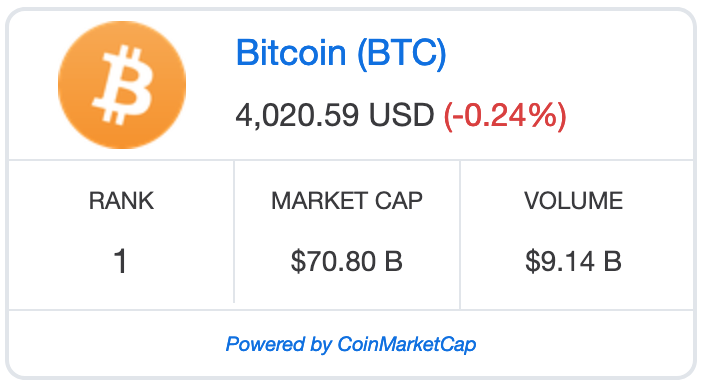 Bitcoin is currently trading at a price of $4,020 while showing a minor loss of -0.24%, according to coinmarketcap.com. Most analysts are looking at the upper bound of BTC’s current trading range, the $4,200 price mark, which will most likely act as a level of serious resistance again. However, a Switzerland-based cryptocurrency analyst, who goes by the Twitter handle, Crypto Krillin, recently took to Twitter to state that the moment of truth for Bitcoin is very near. According to the crypto trader, or BTC will fly straight towards the $5,500 price mark, or we will re-visit $3,000. Read more: Bitcoin or Gold? Or both? The Swiss cryptocurrency trader is not the only crypto analyst who seems to be convinced that Bitcoin’s upside target currently exists around the $5,500 price mark. Just a few days ago, Chepicap reported that Galaxy, another popular cryptocurrency analyst on Twitter, explained to his nearly 50k followers that Bitcoin is pointing to a promising potential for the number one cryptocurrency, hinting to an imminent surge of 35% to $5500. Despite many analysts reporting optimistic views on Bitcoin's near-future upward breakout, another widely recognized cryptocurrency trader known to the Twitter community as 'The Crypto Dog', recently came forward stating that it is still possible for Bitcoin to drop to $3,500 in the short term, adding that the market conditions haven't changed over the last several days. According to crypto technical analyst known as DonAlt, we can only conclude crypto winter is over until Bitcoin crosses the $4,600 threshold and moves towards $5,000 and $6,000. Is NOW a good time to BUY BITCOIN?Subscribe to the Chepicap YouTube Channel for more videos!